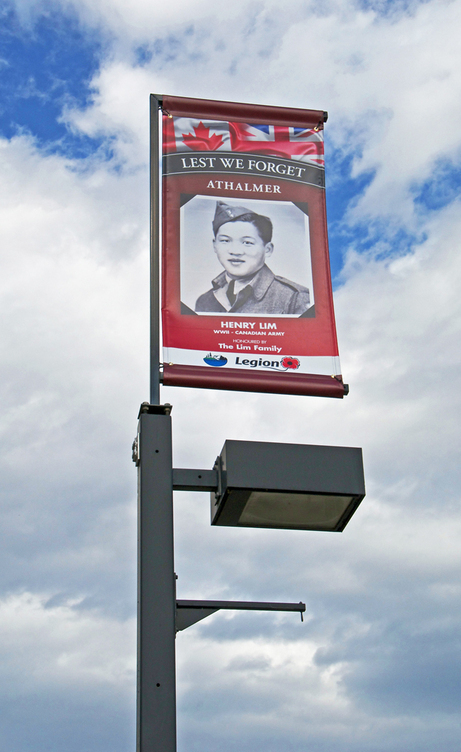 While searching the internet last fall, I came upon a photograph of a veteran memorial banner hanging in Whitby, Ontario. 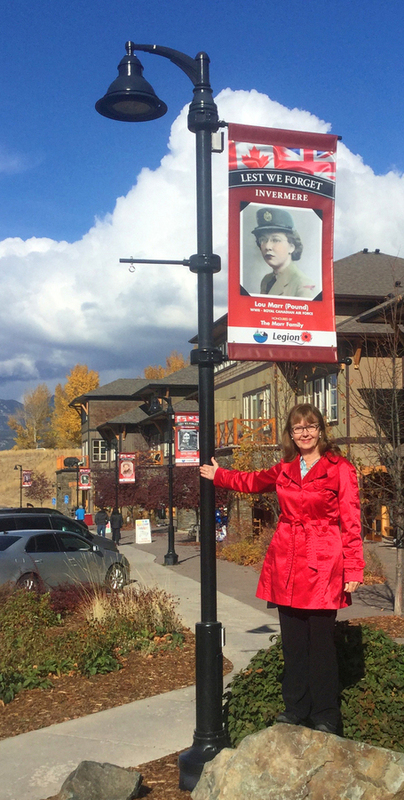 The idea of putting individual faces on banners was so powerful that I was captivated by doing something similar here in the Columbia Valley. Our area is composed of Invermere plus a handful of smaller communities, with a combined population of about 10,000 people. I called a couple of Royal Canadian Legion members in Ontario for advice. The program actually started in the Maritimes and has been adopted by several communities in Ontario. It hasn’t gotten farther west, to my knowledge, than Swift Current, Saskatchewan, which hung banners for the first time in November 2016. First I approached the local Legion Branch 71, and then our municipal council. With both of their approvals under my belt, I looked for someone to help me, and was thankful when Sandi Jones stepped forward. I could not have done this without her. Here’s a photo of Sandi with her father’s banner. Carl Jones and his brother Jack served in Scotland with the Canadian Forestry Corps. I wrote their story earlier, and you can read it by clicking here: Carl and Jack Jones. I will spare you the details of the preliminary organization: identifying the number and size of banners to fit existing hardware on the light poles; obtaining quotes from printers around Western Canada; requesting the banner images from Whitby, Ontario designer Emma Inkpen of Inkpen Studios, who provided them for free; working with Dee Conklin, owner of our local printer Palliser Printing, which was unable to print vinyl banners but kindly volunteered to prepare the digital files for Anvy Digital Imaging in Calgary; drawing up an application form and deciding how much to charge families for their sponsorships; promoting the program through our local newspaper, the Columbia Valley Pioneer; through Facebook; and through word of mouth. All this was done even before we began to collect applications from the sponsoring families. We launched the program in December 2016. Nine months later, you can imagine how excited we were to see the town workers finally hanging the banners! Both Sandi and I could not hold back our tears as we saw the results of all our hard work (and a few sleepless nights, I must admit). The banners will go up at the beginning of October and come down in November, every year for at least the next five years. I wish I could show you all thirty-seven double-sided banners, featuring seventy-four vets in total, but I'll restrict myself to a few examples. Some of them were easier to capture on film than others, due to the lighting and time of day. I interviewed Lou before her death, and you can read her story by clicking here: Lou Marr: RCAF Camerawoman. 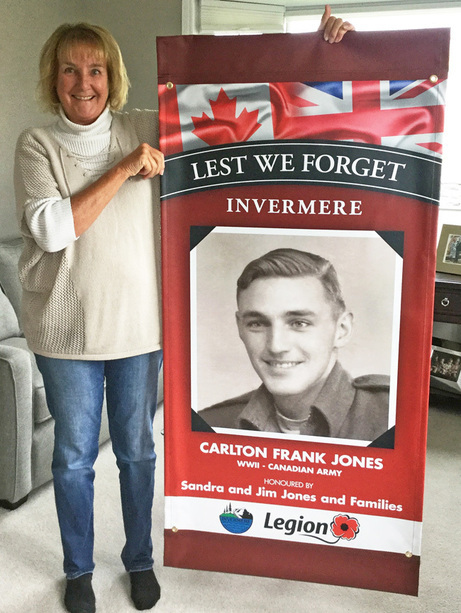 On the flip side of Lou's banner is her handsome husband Tom, who served in the Canadian Army. He left for overseas shortly after they wed, and they didn't see each other again for four long years. Here's another husband and wife banner. Roger Richer of Vancouver, B.C., sponsored both of his parents. 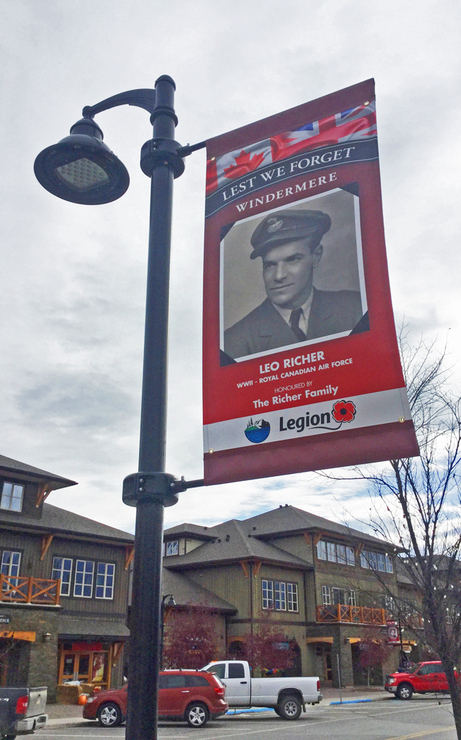 Leo Richer flew a Lancaster bomber in the Royal Canadian Air Force. I interviewed Leo before he died and you can read his story here: Leo Richer: A Rookie Pilot's Nightmare. 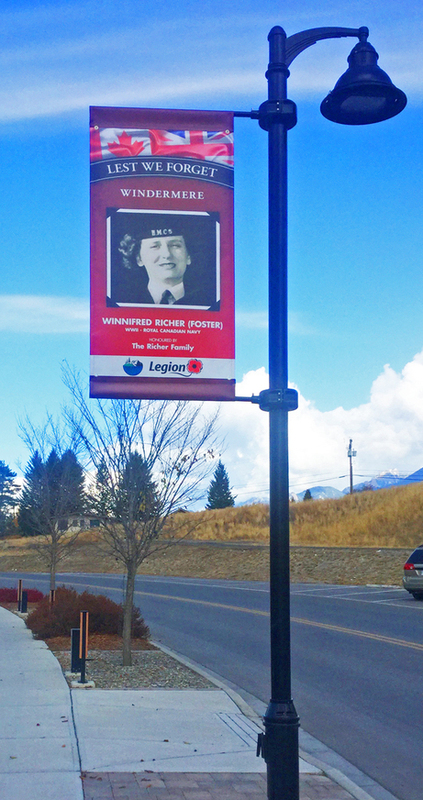 Roger's mother Winnie served as a WREN (Women's Royal Canadian Naval Service) during the war, and her photograph appears on the opposite side of Leo's banner. We even have a brother and sister! The Lims owned a general store here, and both Henry Lim and his sister Lillian volunteered and served in the Canadian Army. The Lim family no longer lives here, but they were eager to honour their family members in this way. I couldn't get a decent photo of Lillian's banner hanging, but this is the full-sized version on the opposite side of Henry's banner. Often overlooked in the history books, women are well represented on our banners. Nancy Lee Tegart was a local rancher, and although she never had children of her own, her niece in Ontario purchased a banner to honour her. Nancy drove a three-tonne truck in Yorkshire while serving in the Royal Canadian Air Force, and you can read her story here: Nancy Tegart: RCAF Rancherette Blazed the Trail. Several banners were dedicated to valley veterans who lost their lives in combat. Harold Braathen of Windermere, one of three brothers who volunteered in World War Two, was a navigator on a bomber crew who was shot down and killed, and his name appears on our cenotaph. His family moved away long ago, but a distant cousin from Calgary sponsored a banner for Harold on behalf of the Braathen family. It was especially heart-warming to see banners hanging for several living veterans in our community. Jim Milne, aged 97, was a navigation instructor in the Royal Canadian Air Force. 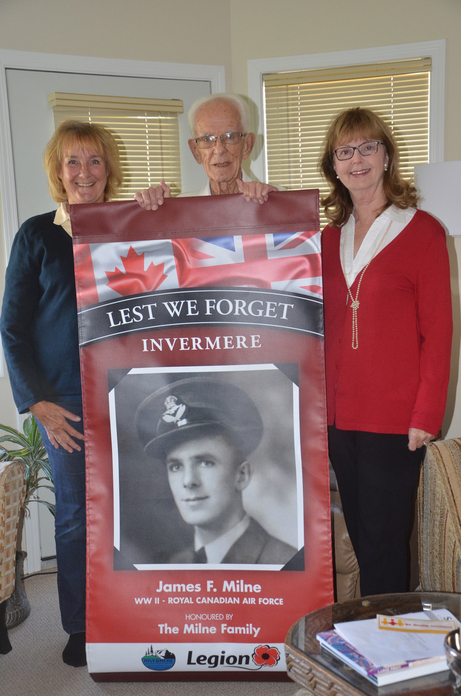 He and his wife Betty still live in Invermere, and I wrote about him recently on Wartime Wednesdays – here’s a photo of Sandi and me showing Jim his banner before it was hung! You can read Jim's story here: Jim Milne: RCAF Pilot, Instructor, Artist. 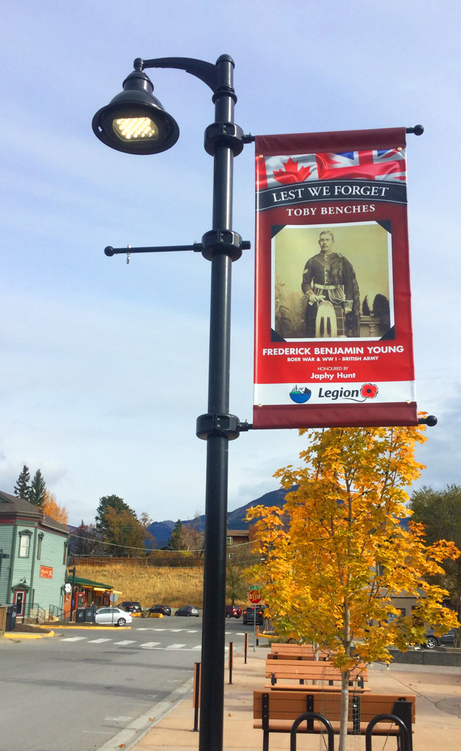 The banner for the earliest veteran was sponsored by local teenager Japhy Hunt in honour of his great-great-grandfather Frederick Young, who served in the Boer War with the British Army before immigrating to Canada. Major Young returned to the army in World War One and spent four years in a German prison camp before coming back here to spend the rest of his life on his ranch. We were also deeply satisfied to have the opportunity to honour our local First Nations veterans, fifteen of whom came from the local Shuswap and Akisqnuk reserves. After returning to Canada, these brave boys never received the recognition they deserved. This is Mathias Sam from the Shuswap Band. The only local native veteran killed in combat, Toby Nicholas from the Akisqnuk First Nation lost his life in Sicily, after days of fierce fighting. His name also appears on the Invermere Cenotaph. Somewhat late in the process, Sandi and I realized that we wanted people to know more about the featured veterans. 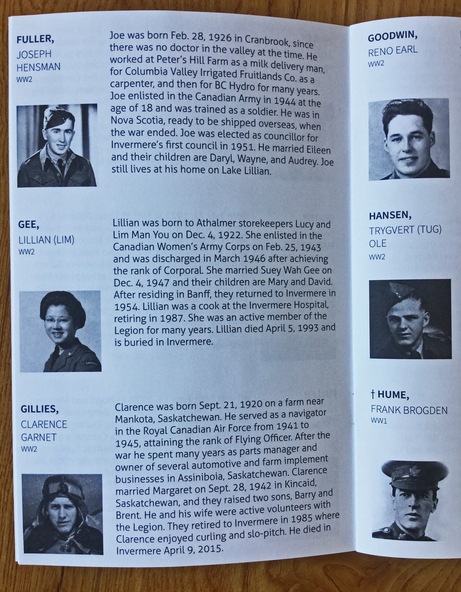 We hired local author Dorothy Isted to research and write a brief biography of each veteran, and then printed the information into booklet form. These are being sold by the local Legion at $2.50 each to cover costs. We hope that groups and individuals, using the booklet as a guide, will take a walking tour and look into the faces of all these brave men and women who defended our freedom. At the end of the day, all our hard work paid off! 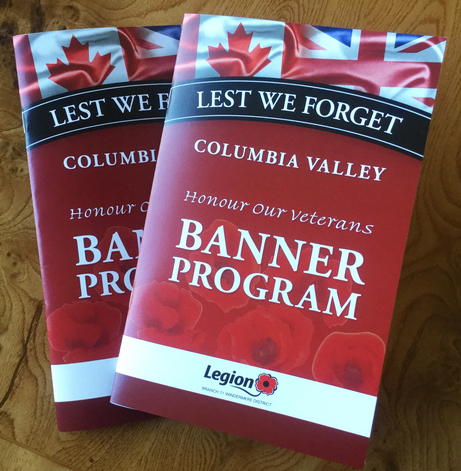 Both Sandi and I have received many, many compliments from people inside and outside the community, and we feel that we have indeed HONOURED OUR VETERANS! Please note: If your family has a veteran who lived in the Columbia Valley at any point in his or her life, contact Sandi Jones at sandijones49@gmail.com to go on a waiting list. The addition of future banners will depend on the availability of hanging hardware, and the sponsorship price may change. Find a sponsor. Usually it is the local branch of the Royal Canadian Legion, although it could be any legitimate organization. In Swift Current, Saskatchewan, the local historical museum sponsored the program. Obtain commitment from your local municipality. 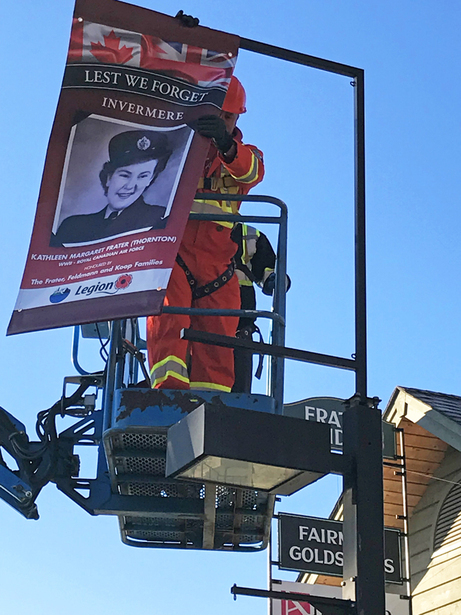 In our case, the District of Invermere agreed to hang the banners and take them down, using the hanging hardware already in place on their light standards. As well, the time frame must not conflict with any other banners already booked. Measure the hardware and determine all the correct specifications. Our banners are 30 by 62 inches, including four-inch pockets, top and bottom. They are made of 23-ounce full-colour vinyl with a blackout sheet in the centre so the light can’t penetrate to the other side. Each veteran’s photograph measures 23 by 25 inches. Determine how many veterans can be sponsored. 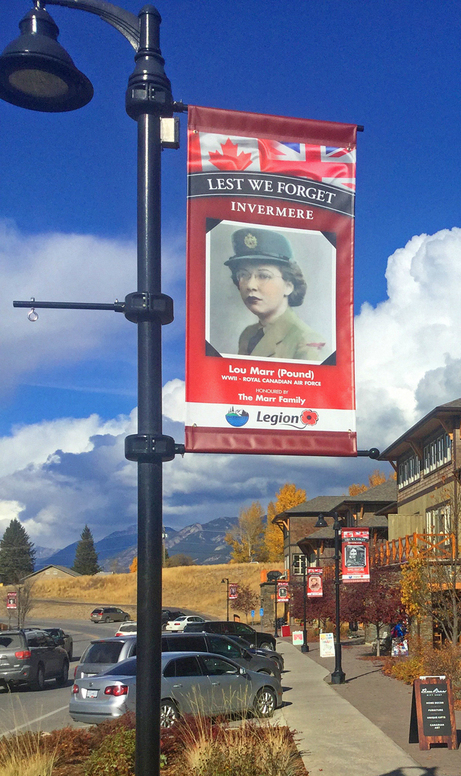 Since Invermere has only 37 light standards with hanging hardware, we created double-sided banners to allow 74 veterans to be featured. This is by no means all the veterans who served, but we offered the program on a first-come, first-served basis. Determine eligibility. The condition was that the veteran must have made this area his permanent home at some point in his or her life. Some veterans were born and raised here; others moved here later. We decided to include only veterans of the Korean War, World War One, and World War Two. Prepare a simple application form including the veteran’s full name, war in which he or she served, name of his or her home community, (our valley includes several smaller communities), and all contact information including the sponsor’s phone number, mailing address, email address, and how the sponsor’s name should appear on the banner. Get a firm quote from the printer so you know how much to charge for sponsorships. We were delighted with this Calgary company: Anvy Digital Imaging. The banners far exceeded our expectations, and are guaranteed to last for at least five years. A cheque must accompany the application, in our case made out to the Royal Canadian Legion. We charged our sponsors $100 per veteran, and that fee covers the next five years. IF you publish biographical information about the veteran, ask the sponsoring family to prepare a 100-word biography and submit it with the application form. It was a huge amount of work for our contract writer to track down this information. KEEP IT ORGANIZED. To track everyone’s applications, cheques, photographs, and other information, Sandi and I shared a google document which could be accessed from either of our computers. We proofread everything at least ten times before it went to the printer. We also emailed, texted, and called each other several hundred times during the process! MAKE IT MANDATORY THAT THE FAMILY PROVIDES A DECENT PHOTO. This was by far the most difficult part of the process. Some families spent weeks searching for photos; others produced only blurry snapshots. Volunteer graphic designer Jerry McLeod spent many hours trying to render them usable. In several cases, we were forced to go with a generic image. If we were to do it again, we wouldn't accept an application without a high-resolution photograph – it was just too much work. ALLOW ENOUGH TIME. Our application deadline was July 1, three months in advance of hanging the banners, and we just made it! A couple of sponsorships fell through at the last minute, the printer was delayed when several digital files had to be edited and resent, we had to add grommets to the banners at the eleventh hour, and we had to wait for someone to pick up the banners in Calgary, to avoid shipping costs. If you have further questions, Sandi Jones has kindly agreed to answer them. Please email her at sandijones49@gmail.com. Next month, you are in for a special treat. 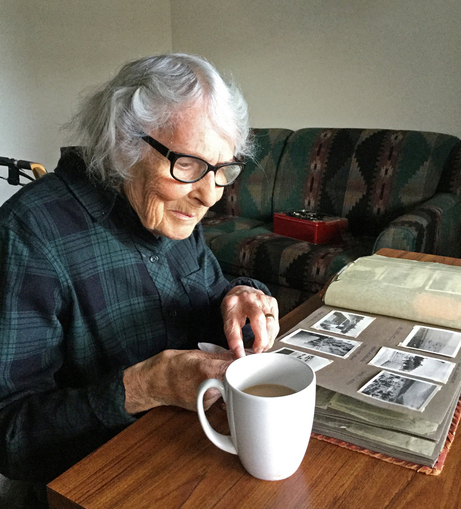 I interviewed a fascinating 97-year-old veteran named Iris Porter, shown below, who still lives in her own home in Calgary. She served in the Royal Air Force in England, and spent two years in Suez, before immigrating to Calgary with her husband in 1948. When my interview is published, you will receive an automatic email from me -- IF you subscribe to Wartime Wednesdays by entering your email address in the yellow box at the top right side of this page. This column marks four years of writing Wartime Wednesdays. In the first month, I had eleven subscribers. Since then, I have accumulated almost 1,000 subscribers! In honour of this four-year anniversary, I'm sending a gift to my very first subscriber. 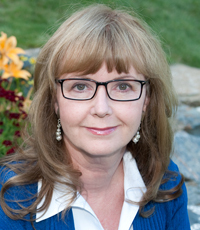 Paula Lefaivre of Red Deer, Alberta, subscribed on October 30, 2014, and has been a loyal follower ever since. 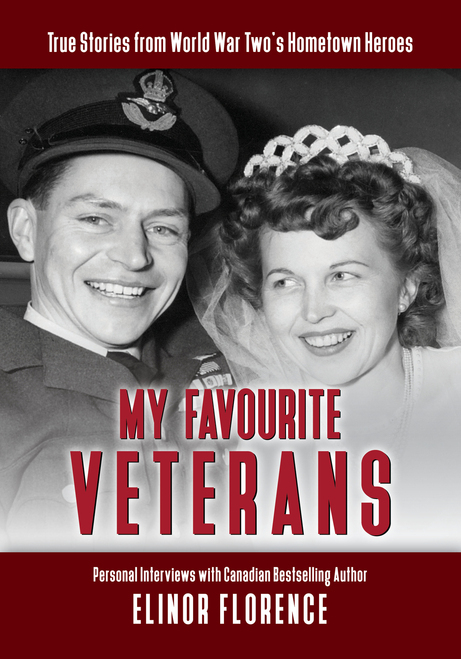 I’m mailing her a copy of my collection of veteran interviews titled My Favourite Veterans: True Stories of World War Two’s Hometown Heroes. Thanks to ALL of you who continue to read and recommend Wartime Wednesdays. 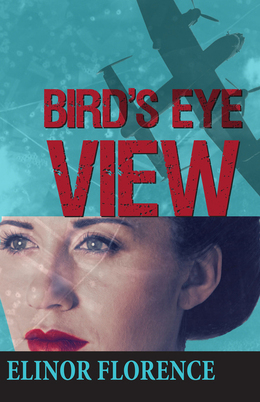 The launch of my new pioneer novel is just four months away! You can read all about the book by clicking here: Wildwood. You may pre-order the book from Amazon here: Order Wildwood. Although it won't be released to the general public for four months, my publisher has sent out Advance Review Copies to professional reviewers, and I've already received my first five-star review from someone known to me only as Ann. Thank you very much, Ann! "In order to inherit a house and land in the wilds of Alberta, Canada, Molly must live on the homestead for one year. Broke and in need of money for medical treatment for her daughter, she agrees. This book follows her year of living, learning, and surviving with no electric, plumbing and little money. A wonderful book that I couldn't stop reading. Finding her aunt's diary, the book runs parallel lines from the 1920s and present day. Sweet and wholesome." As I mentioned in previous blog posts, my plan is to publish photos of "Things That Inspired Wildwood." 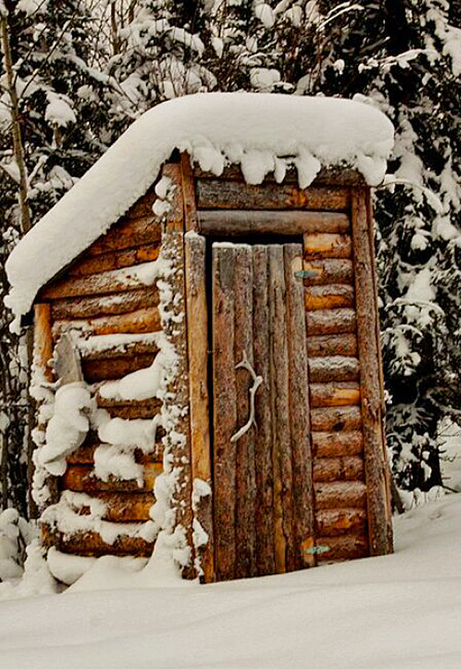 The photo below shows the ubiquitous outdoor toilet, something that I was only too familiar with in my childhood, since my family farm near North Battleford, Saskatchewan didn't have indoor plumbing until I was fourteen years old! Might YOU be an Early Bird? Are you social media savvy? Do you know lots of other readers? If so, you might like to join my private group called Elinor’s Early Birds and help me promote my new novel, Wildwood. If you want to know more about my group, email elinor1@telus.net and I’ll send you some information about joining the Early Birds.